It is a BEAU-TI-FUL day here today! What a relief from the stubborn heat and humidity. My windows are open and there is a wonderful summer breeze flirting with the papers on my desk. Last evening I took Gracie for a nice long walk. The sun was setting into its pinks, oranges and purples and the air, oh, the air was fresh and clean. The locust were buzzing and the fireflies were rising from the ground. It made me think of summers down at my Grandmother’s house. The air was always fresher and sweeter there. After a long day of playing outside, we would take our baths, put our jammies on and have cookies and milk before bed. It’s funny how things come back to you when you allow your mind to open up and think wildly. I remembered the soap. There were always several bars of soap that were big and heavy for small hands. Each of a different shape, color and smell. The green soap was my Grandfathers. “Don’t use that soap, it’ll take the skin right off you”, my grandmother told us, “use the one that floats.” Well, we had to test them all for their buoyancy. If you picked the wrong one and it sank, it was almost impossible to find until the water was drained. Good clean memories of soap. I love your shared memories!! I long for cool summer breeezes...glad someone is getting them :-) I think I only remember green lava soap... great pic of the day! 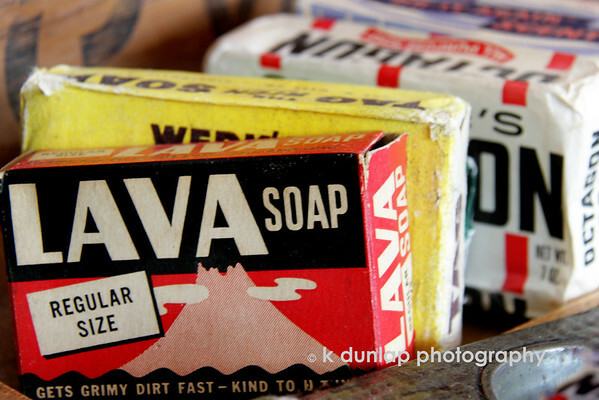 Ah the good old days of Lava soap. Things have changed so much over time. Sweet shot Kris and of course your words Rock! I'm surprised they still make these products that I remember through the decades, very nice close-up. Not only do you take fabulous photographs, the captions you include bring back so many memories. What a priceless combination! Funny how something simple can bring back such great memories. Gosh, I haven't seen Lava soap in so long. I remember once using lava to take a bath with (didn't know any better) and believe me, I never did that again. Thanks for bringing back a fun memory. Fantastic capture to go with truly awesome commentary...very nicely done!! !